This illustration shows the position of NASA’s Voyager 1 and Voyager 2 probes, outside of the heliosphere, a protective bubble created by the Sun that extends well past the orbit of Pluto. For the second time in history, a human-made object has reached the space between the stars. NASA’s Voyager 2 probe now has exited the heliosphere – the protective bubble of particles and magnetic fields created by the Sun. Members of NASA’s Voyager team will discuss the findings at a news conference at 11 a.m. EST (8 a.m. PST) today at the meeting of the American Geophysical Union (AGU) in Washington. The news conference will stream live on the agency’s website. Comparing data from different instruments aboard the trailblazing spacecraft, mission scientists determined the probe crossed the outer edge of the heliosphere on Nov. 5. This boundary, called the heliopause, is where the tenuous, hot solar wind meets the cold, dense interstellar medium. Its twin, Voyager 1, crossed this boundary in 2012, but Voyager 2 carries a working instrument that will provide first-of-its-kind observations of the nature of this gateway into interstellar space. Voyager 2 now is slightly more than 11 billion miles (18 billion kilometers) from Earth. Mission operators still can communicate with Voyager 2 as it enters this new phase of its journey, but information – moving at the speed of light – takes about 16.5 hours to travel from the spacecraft to Earth. By comparison, light traveling from the Sun takes about eight minutes to reach Earth. The most compelling evidence of Voyager 2’s exit from the heliosphere came from its onboard Plasma Science Experiment (PLS), an instrument that stopped working on Voyager 1 in 1980, long before that probe crossed the heliopause. Until recently, the space surrounding Voyager 2 was filled predominantly with plasma flowing out from our Sun. This outflow, called the solar wind, creates a bubble – the heliosphere – that envelopes the planets in our solar system. The PLS uses the electrical current of the plasma to detect the speed, density, temperature, pressure and flux of the solar wind. The PLS aboard Voyager 2 observed a steep decline in the speed of the solar wind particles on Nov. 5. Since that date, the plasma instrument has observed no solar wind flow in the environment around Voyager 2, which makes mission scientists confident the probe has left the heliosphere. 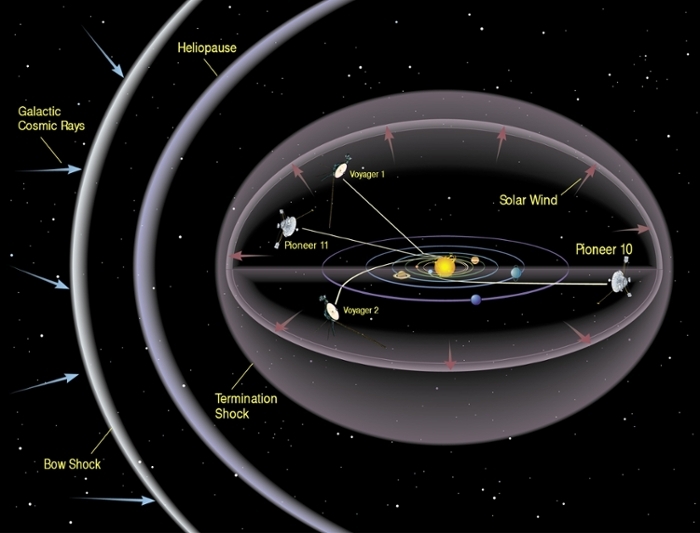 In addition to the plasma data, Voyager’s science team members have seen evidence from three other onboard instruments – the cosmic ray subsystem, the low energy charged particle instrument and the magnetometer – that is consistent with the conclusion that Voyager 2 has crossed the heliopause. Voyager’s team members are eager to continue to study the data from these other onboard instruments to get a clearer picture of the environment through which Voyager 2 is traveling. “There is still a lot to learn about the region of interstellar space immediately beyond the heliopause,” said Ed Stone, Voyager project scientist based at Caltech in Pasadena, California. Together, the two Voyagers provide a detailed glimpse of how our heliosphere interacts with the constant interstellar wind flowing from beyond. Their observations complement data from NASA’s Interstellar Boundary Explorer (IBEX), a mission that is remotely sensing that boundary. NASA also is preparing an additional mission – the upcoming Interstellar Mapping and Acceleration Probe (IMAP), due to launch in 2024 – to capitalize on the Voyagers’ observations. While the probes have left the heliosphere, Voyager 1 and Voyager 2 have not yet left the solar system, and won’t be leaving anytime soon. The boundary of the solar system is considered to be beyond the outer edge of the Oort Cloud, a collection of small objects that are still under the influence of the Sun’s gravity. The width of the Oort Cloud is not known precisely, but it is estimated to begin at about 1,000 astronomical units (AU) from the Sun and to extend to about 100,000 AU. One AU is the distance from the Sun to Earth. It will take about 300 years for Voyager 2 to reach the inner edge of the Oort Cloud and possibly 30,000 years to fly beyond it. The Voyager probes are powered using heat from the decay of radioactive material, contained in a device called a radioisotope thermal generator (RTG). The power output of the RTGs diminishes by about four watts per year, which means that various parts of the Voyagers, including the cameras on both spacecraft, have been turned off over time to manage power. Voyager 2 launched in 1977, 16 days before Voyager 1, and both have traveled well beyond their original destinations. The spacecraft were built to last five years and conduct close-up studies of Jupiter and Saturn. However, as the mission continued, additional flybys of the two outermost giant planets, Uranus and Neptune, proved possible. As the spacecraft flew across the solar system, remote-control reprogramming was used to endow the Voyagers with greater capabilities than they possessed when they left Earth. Their two-planet mission became a four-planet mission. Their five-year lifespans have stretched to 41 years, making Voyager 2 NASA’s longest running mission. The Voyager story has impacted not only generations of current and future scientists and engineers, but also Earth’s culture, including film, art and music. Each spacecraft carries a Golden Record of Earth sounds, pictures and messages. Since the spacecraft could last billions of years, these circular time capsules could one day be the only traces of human civilization. Voyager’s mission controllers communicate with the probes using NASA’s Deep Space Network (DSN), a global system for communicating with interplanetary spacecraft. The DSN consists of three clusters of antennas in Goldstone, California; Madrid, Spain; and Canberra, Australia. The Voyager Interstellar Mission is a part of NASA’s Heliophysics System Observatory, sponsored by the Heliophysics Division of NASA’s Science Mission Directorate in Washington. JPL built and operates the twin Voyager spacecraft. NASA’s DSN, managed by JPL, is an international network of antennas that supports interplanetary spacecraft missions and radio and radar astronomy observations for the exploration of the solar system and the universe. The network also supports selected Earth-orbiting missions. The Commonwealth Scientific and Industrial Research Organisation, Australia’s national science agency, operates both the Canberra Deep Space Communication Complex, part of the DSN, and the Parkes Observatory, which NASA has been using to downlink data from Voyager 2 since Nov. 8. Jet Propulsion Laboratory (JPL) is a federally funded research and development center and NASA field center located in the San Gabriel Valley area of Los Angeles County, California, United States. Although the facility has a Pasadena postal address, it is actually headquartered in the city of La Cañada Flintridge, on the northwest border of Pasadena. JPL is managed by the nearby California Institute of Technology (Caltech) for the National Aeronautics and Space Administration. The Laboratory’s primary function is the construction and operation of robotic planetary spacecraft, though it also conducts Earth-orbit and astronomy missions. It is also responsible for operating NASA’s Deep Space Network. Using longer exposures and sophisticated processing techniques, scientists have taken extraordinarily high-fidelity pictures of the Sun’s outer atmosphere – what we call the corona – and discovered fine details that have never been detected before. The Sun is a complex object, and with the soon-to-be-launched Parker Solar Probe we’re on the verge of learning so much more about it. But there’s still a lot we can do with our current technology, as scientists from the Southwest Research Institute (SwRI) have just demonstrated. 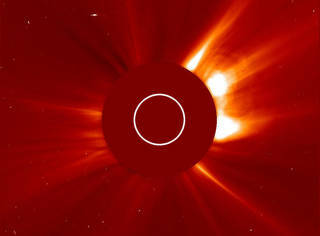 The team used the COR-2 coronagraph instrument on NASA’s Solar and Terrestrial Relations Observatory-A (STEREO-A) to study details in the Sun’s outer atmosphere. This instrument takes images of the atmosphere by using what is known as an occulting disc – a disc placed in front of the lens that blocks out the actual Sun from the image, and therefore the light that would overwhelm the fine details in the plasma of the Sun’s atmosphere. The corona is extremely hot, much hotter than the inner photosphere’s 5,800 Kelvin, coming in at between 1 and 3 million Kelvin. It’s also the source of solar wind – the constant stream of charged particles that flows out from the Sun in all directions. When measurements of the solar wind are taken near Earth, the magnetic fields embedded therein are complex and interwoven, but it’s unclear when this turbulence occurs. “In deep space, the solar wind is turbulent and gusty,” says solar physicist Craig DeForest of the SwRI. If the turbulence was occurring at the source of the solar wind – the Sun – then we should have been able to see complex structures in the corona as the cause of it, but previous observations showed no such structures. Instead, they showed the corona as a smooth, laminar structure. Except, as it turns out, that wasn’t the case. The structures were there, but we hadn’t been able to obtain a high enough image resolution to see them. To obtain the images, the research team ran a special three-day campaign wherein the instrument took more frequent and longer-exposure images than it usually does, allowing more time for light from faint sources to be detected by the coronagraph. But that was only part of the process. Although the occulting disc does a great job at filtering out the bright light from the Sun, there’s still a great deal of noise in the resulting images, both from the surrounding space and the instrument. Obviously, since STEREO-A is in space, altering the hardware isn’t an option, so DeForest and his team worked out a technique for identifying and removing that noise, vastly improving the data’s signal-to-noise ratio. They developed new filtering algorithms to separate the corona from noise, and adjust brightness. And, perhaps more challengingly, correct for the blur caused by the motion of the solar wind. They discovered that the coronal loops known as streamers – which can erupt into the coronal mass ejections that send plasma and particles shooting out into space – are not one single structure. They also found there’s no such thing as the Alfvén surface – a theoretical, sheet-like boundary where the solar wind starts moving forward faster than waves can travel backwards through it, and it disconnects from the Sun, moving beyond its influence. But the research also presented a new mystery to probe, as well. At a distance of about 10 solar radii the solar wind suddenly changes character. But it returns to normal farther out from the Sun, indicating that there’s some interesting physics happening at 10 solar radii. Figuring out what that is may require some help from Parker, for which this research is key. Parker is due to launch in August. Meanwhile, the team’s research has been published in The Astrophysical Journal. 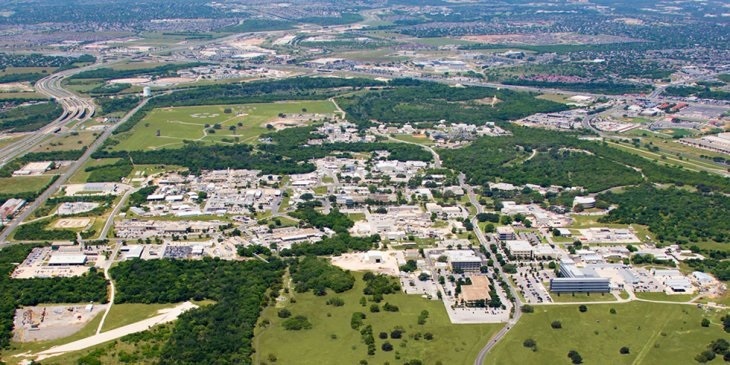 Southwest Research Institute (SwRI) is an independent, nonprofit applied research and development organization. The staff of nearly 2,800 specializes in the creation and transfer of technology in engineering and the physical sciences. SwRI’s technical divisions offer a wide range of technical expertise and services in such areas as engine design and development, emissions certification testing, fuels and lubricants evaluation, chemistry, space science, nondestructive evaluation, automation, mechanical engineering, electronics, and more. A team of Japanese planetary researchers led by Osaka University’s Professor Kentaro Terada has discovered that the solar wind and Earth’s magnetic field can transport high-energy ions of biogenic oxygen from the atmosphere of our planet to the lunar surface. This image shows how the solar wind transports ions of oxygen from the Earth’s atmosphere to the Moon. Image credit: Osaka University / NASA. “The Earth is protected from solar wind and cosmic rays by the planet’s magnetic field,” Professor Terada and colleagues explained. In a paper published the journal Nature Astronomy, the researchers report observations from the Japanese spacecraft Kaguya of significant numbers of high-energy oxygen ions, seen only when the Moon was in the Earth’s plasma sheet. “We succeeded in observing that oxygen from the ionosphere of Earth was transported to the Moon 236,000 miles (380,000 km) away,” they said. Oxygen ions detected by the team had a high energy of 1-10 keV. “These ions can be implanted into a depth of tens of nanometers of a metal particle,” the authors said. “Our Kaguya observation of significant Earth wind from the current geomagnetic field strengthens the hypothesis that information on the lost ancient atmosphere of our planet could be preserved on the surface of lunar soils,” the scientists concluded. Science News is edited for an educated readership of professionals, scientists and other science enthusiasts. Written by a staff of experienced science journalists, it treats science as news, reporting accurately and placing findings in perspective. Science News and its writers have won many awards for their work; here’s a list of many of them. Published since 1922, the biweekly print publication reaches about 90,000 dedicated subscribers and is available via the Science News app on Android, Apple and Kindle Fire devices. Updated continuously online, the Science News website attracted over 12 million unique online viewers in 2016. Science News is published by the Society for Science & the Public, a nonprofit 501(c) (3) organization dedicated to the public engagement in scientific research and education. Plasma from the Sun known as the slow solar wind has been observed far away from where scientists thought it was produced. Now new simulations may have resolved the puzzle of where the slow solar wind comes from and how it escapes the Sun to travel through our solar system. The Sun’s atmosphere, known as the corona, is divided into two types of regions based on the behavior of magnetic field lines. In closed-field regions, the magnetic field is firmly anchored in the photosphere at both ends of field lines, so traveling plasma is confined to coronal loops and must return to the Sun’s surface. In open-field regions, only one end of each magnetic field line is anchored in the photosphere, so plasma is able to stream from the Sun’s surface out into the solar system. This second type of region — known as a coronal hole — is thought to be the origin of fast-moving plasma measured in our solar system and known as the fast solar wind. But we also observe a slow solar wind: plasma that moves at speeds of less than 500 km/s. The slow solar wind presents a conundrum. Its observational properties strongly suggest it originates in the hot, closed corona rather than the cooler, open regions. But if the slow solar wind plasma originates in closed-field regions of the Sun’s atmosphere, then how does it escape from the Sun? A team of scientists led by Aleida Higginson (University of Michigan) has now used high-resolution, three-dimensional magnetohydrodynamic simulations to show how the slow solar wind can be generated from plasma that starts out in closed-field parts of the Sun. Motions on the Sun’s surface near the boundary between open and closed-field regions — the boundary that marks the edges of coronal holes and extends outward as the heliospheric current sheet — are caused by supergranule-like convective flows. 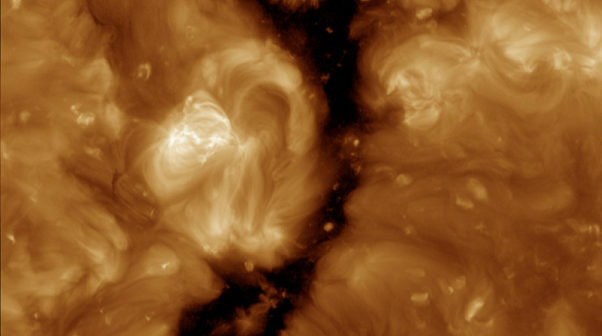 These motions drive magnetic reconnection that funnel plasma from the closed-field region onto enormous arcs that extend far away from the heliospheric current sheet, spanning tens of degrees in latitude and longitude. The simulations by Higginson and collaborators demonstrate that closed-field plasma from coronal-hole boundaries can be successfully channeled into the solar system. Due to the geometry and dynamics of the coronal holes, the plasma can travel far from the heliospheric current sheet, resulting in a slow solar wind of closed-field plasma consistent with our observations. These simulations therefore suggest a process that resolves the long-standing puzzle of the slow solar wind. See the full article for further research with links. NASA’s Goddard Space Flight Center, Greenbelt, Md. New data from NASA’s Cassini mission, combined with measurements from the two Voyager spacecraft and NASA’s Interstellar Boundary Explorer, or IBEX, suggests that our sun and planets are surrounded by a giant, rounded system of magnetic field from the sun — calling into question the alternate view of the solar magnetic fields trailing behind the sun in the shape of a long comet tail. The sun releases a constant outflow of magnetic solar material — called the solar wind — that fills the inner solar system, reaching far past the orbit of Neptune. This solar wind creates a bubble, some 23 billion miles across, called the heliosphere. Our entire solar system, including the heliosphere, moves through interstellar space. The prevalent picture of the heliosphere was one of comet-shaped structure, with a rounded head and an extended tail. But new data covering an entire 11-year solar activity cycle show that may not be the case: the heliosphere may be rounded on both ends, making its shape almost spherical. A paper on these results was published in Nature Astronomy on April 24, 2017. “Instead of a prolonged, comet-like tail, this rough bubble-shape of the heliosphere is due to the strong interstellar magnetic field — much stronger than what was anticipated in the past — combined with the fact that the ratio between particle pressure and magnetic pressure inside the heliosheath is high,” said Kostas Dialynas, a space scientist at the Academy of Athens in Greece and lead author on the study. New data from NASA’s Cassini, Voyager and Interstellar Boundary Explorer missions show that the heliosphere — the bubble of the sun’s magnetic influence that surrounds the inner solar system — may be much more compact and rounded than previously thought. 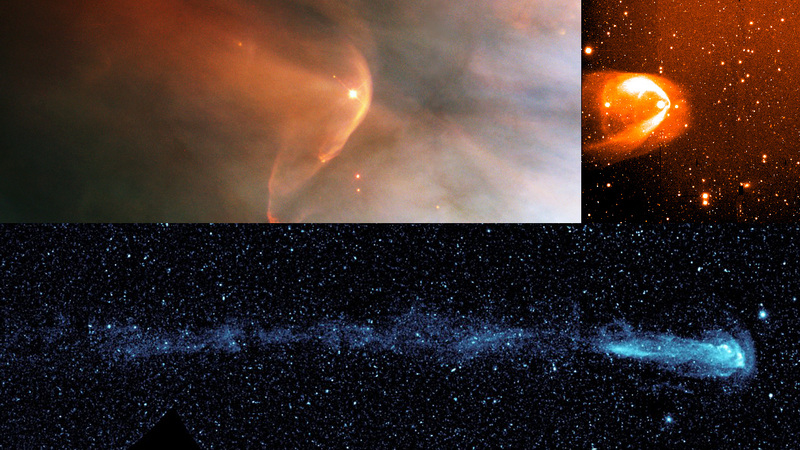 The image on the left shows a compact model of the heliosphere, supported by this latest data, while the image on the right shows an alternate model with an extended tail. The main difference is the new model’s lack of a trailing, comet-like tail on one side of the heliosphere. This tail is shown in the old model in light blue. An instrument on Cassini, which has been exploring the Saturn system over a decade, has given scientists crucial new clues about the shape of the heliosphere’s trailing end, often called the heliotail. When charged particles from the inner solar system reach the boundary of the heliosphere, they sometimes undergo a series of charge exchanges with neutral gas atoms from the interstellar medium, dropping and regaining electrons as they travel through this vast boundary region. Some of these particles are pinged back in toward the inner solar system as fast-moving neutral atoms, which can be measured by Cassini. Because these particles move at a small fraction of the speed of light, their journeys from the sun to the edge of the heliosphere and back again take years. So when the number of particles coming from the sun changes — usually as a result of its 11-year activity cycle — it takes years before that’s reflected in the amount of neutral atoms shooting back into the solar system. Cassini’s new measurements of these neutral atoms revealed something unexpected — the particles coming from the tail of the heliosphere reflect the changes in the solar cycle almost exactly as fast as those coming from the nose of the heliosphere. “If the heliosphere’s ‘tail’ is stretched out like a comet, we’d expect that the patterns of the solar cycle would show up much later in the measured neutral atoms,” said Krimigis. The heliosphere is the bubble-like region of space dominated by the Sun, which extends far beyond the orbit of Pluto. Plasma “blown” out from the Sun, known as the solar wind, creates and maintains this bubble against the outside pressure of the interstellar medium, the hydrogen and helium gas that permeates the Milky Way Galaxy. The solar wind flows outward from the Sun until encountering the termination shock, where motion slows abruptly. The Voyager spacecraft have actively explored the outer reaches of the heliosphere, passing through the shock and entering the heliosheath, a transitional region which is in turn bounded by the outermost edge of the heliosphere, called the heliopause. The overall shape of the heliosphere is controlled by the interstellar medium through which it is traveling, as well as the Sun, and is not perfectly spherical. The limited data available and unexplored nature of these structures have resulted in many theories. But because patterns from solar activity show just as quickly in tail particles as those from the nose, that implies the tail is about the same distance from us as the nose. This means that long, comet-like tail that scientists envisioned may not exist at all — instead, the heliosphere may be nearly round and symmetrical. A rounded heliosphere could come from a combination of factors. Data from Voyager 1 show that the interstellar magnetic field beyond the heliosphere is stronger than scientists previously thought, meaning it could interact with the solar wind at the edges of the heliosphere and compact the heliosphere’s tail. The structure of the heliosphere plays a big role in how particles from interstellar space — called cosmic rays — reach the inner solar system, where Earth and the other planets are. “This data that Voyager 1 and 2, Cassini and IBEX provide to the scientific community is a windfall for studying the far reaches of the solar wind,” said Arik Posner, Voyager and IBEX program scientist at NASA Headquarters in Washington, D.C., who was not involved with this study. NASA’s Goddard Space Flight Center is home to the nation’s largest organization of combined scientists, engineers and technologists that build spacecraft, instruments and new technology to study the Earth, the sun, our solar system, and the universe. Named for American rocketry pioneer Dr. Robert H. Goddard, the center was established in 1959 as NASA’s first space flight complex. Goddard and its several facilities are critical in carrying out NASA’s missions of space exploration and scientific discovery. The details of how rays in the sun’s upper atmosphere transitioned into solar wind have always been a mystery. Now they’re starring in a movie. Until recently, the solar wind was virtually an article of faith. But in the summer of 2016 scientists were able to see it for the first time. Moving from the center outward, our dear sun has a core, radiative and convective zones, a photosphere, a chromosphere, and a corona — the sun’s atmosphere. The corona extends about a million miles into space, and is what we see when we look into the sky, or when we drew the sun as children. As solar plasma escapes from the sun, the sun’s gravitational hold weakens with distance, eventually reaching a transition point between the corona and the solar wind. This turbulent blast of plasma extends in all directions from the sun and extends to the outer reaches of our solar system. Scientists refer to this ‘bubble’ as the heliosphere. We refer to it as home. The sun is vast, but its atmosphere is even bigger. Bigger still is the area covered by the solar wind.The solar wind blows throughout our solar system. Courtesy of NASA. Reporting in The Astrophysical Journal, scientists offer a nuanced definition of our sun with visual evidence to back it up. Turns out, the sun is neither a hard ball in space nor an immense raging ball of fire. Rather, it is a mass of particles and magnetic fields extending outward well beyond the sun’s actual surface. This atmosphere pushes outward throughout our solar system, engulfing all the planets in the solar wind. To create the first movie of this wind, scientists started with images taken over a 15-day interval in late December of 2008 from the Heliospheric Imager in the SECCHI suite onboard NASA’s Solar Terrestrial Relations Observatory (STEREO). Blowin’ in the wind. Animation of filtered imagery taken from the Heliospheric Imager in the SECCHI suite onboard NASA’s Solar Terrestrial Relations Observatory (STEREO). Courtesy C. E. DeForest, et al. Then, using novel image processing techniques including background brightness suppression, scientists were able to discern the boundary between the upper corona and the solar wind. No longer mere theory or an an article of faith, astrophysicists can now see the solar wind with their own eyes. Imaging the solar wind is significant because it identifies a shift in plasma texture as it flows away from the sun. Objects placed in this upper extreme of the solar corona (say, a satellite, space ship, or a person) will be safer and more productive with this better understanding of the solar wind. And the images look pretty cool, too. Science Node is an international weekly online publication that covers distributed computing and the research it enables. In its current incarnation, Science Node is also an online destination where you can host a profile and blog, and find and disseminate announcements and information about events, deadlines, and jobs. In the near future it will also be a place where you can network with colleagues. What does solar wind look like when it first forms from the Sun’s corona? Now, with new satellite images manipulated to remove background light, scientists can answer that question. “This is part of the last major connection we need to make to understand how [the Sun] influences the environment around the Earth,” Craig DeForest, an astrophysicist at the Southwest Research Institute in Boulder, Colo., told Eos. DeForest is the lead author on a new paper describing the novel technique, published last week in the Astrophysical Journal. Back in the 1960s, scientists discovered the solar wind, a constant flow from the Sun of extremely high temperature plasma that’s so hot the Sun’s gravity can’t hold it. Scientists knew that the solar wind was somehow connected to the Sun’s corona—the bright layer of the Sun’s atmosphere that can be seen during a solar eclipse—but until now, scientists weren’t sure how one transitioned into the other. This transition is important because “we’re trying to understand, among other things, why the solar wind near the Earth is variable and gusty,” DeForest said. This gustiness can affect things like the trajectory of coronal mass ejections—huge magnetic explosions from that Sun that, when they hit Earth, can knock out telecommunications, short out satellite circuitry, and damage electrical transmission lines. But studying the transition between the corona and the solar wind is difficult—the solar wind is very faint against a background full of stars and interplanetary dust, DeForest said, making it hard to discern exactly what is happening as the solar wind gets created. When scientists looked at previous images and “saw the [corona] fade, it was difficult to tell whether it was fading in an absolute sense or dropping below stellar background,” DeForest continued. With computer-processed images from NASA’s Solar Terrestrial Relations Observatory (STEREO), the scientists finally observed this transition. The processing removed objects of “fixed brightness,” DeForest said, like the dust cloud that fills the inner solar system and the background stars themselves. That left the moving and variable features of the solar wind itself. Scientists already knew that masses of particles in the corona are controlled by magnetic fields, which gives the Sun its “rays”—similar to those in a child’s drawing, DeForest said. The new images revealed the farthest reaches of the magnetically controlled corona, showing that once the material travels about a third of the distance from the Sun to the Earth, the magnetic fields weaken enough that solar wind particles can disperse from the field lines and fan out more like an Earthly wind. The video below, from NASA, compares this transformation of the solar wind from rays to dispersed particles to the way water shoots from a water gun or hose: Closer to the water gun, the water is one mass, but as it moves farther from the gun, it disperses into a spray of individual droplets. Investigating this transition region will help scientists to predict the arrival and strength of the Sun’s outbursts— Earth-bound coronal mass ejections—after they pass through a full astronomical unit of the existing solar wind, DeForest said. From our vantage point on the ground, the sun seems like a still ball of light, but in reality, it teems with activity. Eruptions called solar flares and coronal mass ejections explode in the sun’s hot atmosphere, the corona, sending light and high energy particles out into space. The corona is also constantly releasing a stream of charged particles known as the solar wind. But this isn’t the kind of wind you can fly a kite in. Even the slowest moving solar wind can reach speeds of around 700,000 mph. And while scientists know a great deal about solar wind, the source of the slow wind remains a mystery. Now, a team at NASA’s Goddard Space Flight Center in Greenbelt, Maryland, has explored a detailed case study of the slow solar wind, using newly processed observations close to Earth to determine what in fact seeded that wind 93 million miles away, back on the sun. The team spotted tell-tale signs in the wind sweeping by Earth showing that it originated from a magnetic phenomenon known as magnetic reconnection. A paper* on these results was published April 22, 2016, in the journal Geophysical Research Letters. Knowing the source of the slow solar wind is important for understanding the space environment around Earth, as near-Earth space spends most of its time bathed in this wind. 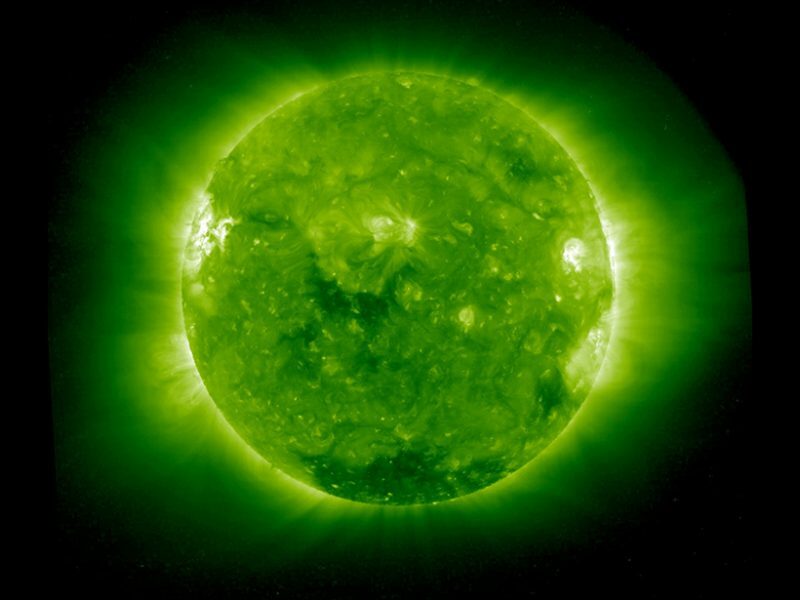 Just as it is important to know the source of cold fronts and warm fronts to predict terrestrial weather, understanding the source of the solar wind can help tease out space weather around Earth — where changes can sometimes interfere with our radio communications or GPS, which can be detrimental to guiding airline and naval traffic. Fast solar wind — not surprisingly — can travel much faster than the slow wind at up to 1.7 million mph, but the most definitive difference between fast and slow solar wind is their composition. Solar wind is what’s known as a plasma, a heated gas made up of charged particles — primarily protons and electrons, with trace amounts of heavier elements such as helium and oxygen. The amount of heavy elements and their charge state, or number of electrons, differ between the two types of wind. By studying its composition, scientists know that fast solar wind emanates from the interior of coronal holes — areas of the solar atmosphere where the corona is darker and colder. The slow solar wind, on the other hand, is associated with hotter regions around the equator, but just how the slow solar wind is released has not been clear. But the new results may have provided an answer. Magnetic reconnection can occur anywhere there are powerful magnetic fields, such as in the sun’s magnetic environment. Imagine a magnetic field line pointing in one direction and another field line nearby moving toward it pointing in the opposite direction. As they come together, the field lines will cancel and re-form, each performing a sort of U-turn and curving to move off in a perpendicular direction. The resulting new magnetic field lines create a large force — like a taut rubber band being released — that flings out plasma. This plasma is the slow solar wind. The team studied an interval of 90-minute periodic structures in the slow wind, and identified magnetic structures that are the telltale fingerprints of magnetic reconnection. They also found that each 90-minute parcel of slow wind showed an intriguing and repeating variability that could only be remnants of magnetic reconnection back at the sun. Researchers first discovered the periodic density structures about 15 years ago using the Wind spacecraft — a satellite launched in 1994 to observe the space environment surrounding Earth. The scientists observed oscillations in the magnetic fields near Earth, known as the magnetosphere. The WIND Satellite launched on November 1, 1994. The first of NASA’s Global Geospace Science (GGS) program. But Wind only gave the researchers measurements of the slow solar wind’s density and velocity, and could not identify its source. For that, they needed composition data. Furthermore, in order to solve this problem, scientists from different disciplines needed to work together to come up with an explanation of the entire system. Kepko studies the magnetosphere, while Viall studies the sun. By observing what’s close to Earth and what’s happening at the sun, the team could determine the source of the slow solar wind. The scientists turned to NASA’s Advanced Composition Explorer. ACE launched in 1997 to study and measure the composition of several types of space material including the solar wind and cosmic rays. It can observe solar particles and helps researchers determine the elemental composition and speeds of solar wind. The team is continuing to look at composition data to find other instances of the periodic density structures to determine if the source for all slow solar wind is magnetic reconnection. Their case study clearly shows that this particular event was the result of magnetic reconnection, but they wish to find other examples to show this is the most common mechanism for powering the slow solar wind. As the team gathers more information about magnetic reconnection and its effects near the sun, it will add to a growing body of knowledge about the phenomenon in general — because magnetic reconnection events take place throughout the universe. “If we can understand this phenomenon here, where we can actually measure the magnetic field, we can get a better handle on how these fundamental physics processes take place in other places in the universe,” Viall said. Earth’s magnetic field acts like a giant shield, protecting the planet from bursts of harmful charged solar particles that could strip away the atmosphere. Gregg Hallinan, an assistant professor of astronomy, aims to detect this kind of space weather on other stars to determine whether planets around these stars are also protected by their own magnetic fields and how that impacts planetary habitability. On Wednesday, February 10, at 8 p.m. in Beckman Auditorium, Hallinan will discuss his group’s efforts to detect intense radio emissions from stars and their effects on any nearby planets. Admission is free. I am an astronomer. My primary focus is the study of the magnetic fields of stars, planets, and brown dwarfs—which are kind of an intermediate object between a planet and a star. Stars and their planets have intertwined relationships. Our sun, for example, produces coronal mass ejections, or CMEs, which are bubbles of hot plasma explosively ejected from the sun out into the solar system. Radiation and particles from these solar events bombard the earth and interact with the atmosphere, dominating the local “space weather” in the environment of Earth. Happily, our planet’s magnetic field shields and redirects CMEs toward the polar regions. This causes auroras—the colorful light in the sky commonly known as the Northern or Southern Lights. Our new telescope, the Owens Valley Long Wavelength Array, images the entire sky instantaneously and allows us to monitor extrasolar space weather on thousands of nearby stellar systems. When a star produces a CME, it also emits a bright burst of radio waves with a specific signature. If a planet has a magnetic field and it is hit by one of these CMEs, it will also become brighter in radio waves. Those radio signatures are very specific and allow you to measure very precisely the strength of the planet’s magnetic field. I am interested in detecting radio waves from exoplanets—planets outside of our solar system—in order to learn more about what governs whether or not a planet has a magnetic field. The presence of a magnetic field on a planet can tell us a lot. Like on our own planet, magnetic fields are an important line of defense against the solar wind, particularly explosive CMEs, which can strip a planet of its atmosphere. Mars is a good example of this. Because it didn’t have a magnetic field shielding it from the sun’s solar wind, it was stripped of its atmosphere long ago. So, determining whether a planet has a magnetic field is important in order to determine which planets could possibly have atmospheres and thus could possibly host life. How did you get into this line of work? From a young age, I was obsessed with astronomy—it’s all I cared for. My parents got me a telescope when I was 7 or 8, and from then on, that was it. As a grad student, I was looking at magnetic fields of cool—meaning low-temperature—objects. When I was looking at brown dwarfs, I found that they behave like planets in that they also have auroras. I had the idea that auroras could be the avenue to examine the magnetic fields of other planets. So brown dwarfs were my gateway into exoplanets. “Using data from an aging NASA spacecraft, researchers have found signs of an energy source in the solar wind that has caught the attention of fusion researchers. NASA will be able to test the theory later this decade when it sends a new probe into the sun for a closer look. The discovery was made by a group of astronomers trying to solve a decades-old mystery: What heats and accelerates the solar wind? The solar wind is a hot and fast flow of magnetized gas that streams away from the sun’s upper atmosphere. It is made of hydrogen and helium ions with a sprinkling of heavier elements. Researchers liken it to the steam from a pot of water boiling on a stove; the sun is literally boiling itself away. Finding that ‘something’ has been a goal of researchers for decades. In the 1970s and 80s, observations by two German/US Helios spacecraft set the stage for early theories, which usually included some mixture of plasma instabilities, magnetohydrodynamic waves, and turbulent heating. Narrowing down the possibilities was a challenge. The answer, it turns out, has been hiding in a dataset from one of NASA’s oldest active spacecraft, a solar probe named Wind. Launched in 1994, Wind is so old that it uses magnetic tapes similar to old-fashioned 8-track tapes to record and play back its data. Equipped with heavy shielding and double-redundant systems to safeguard against failure, the spacecraft was built to last; at least one researcher at NASA calls it the ‘Battlestar Gallactica’ of the heliophysics fleet. Wind has survived almost two complete solar cycles and innumerable solar flares. The next step, agree Kasper and Szabo, is to find out if ion cyclotron waves work the same way deep inside the sun’s atmosphere where the solar wind begins its journey. To find out, NASA is planning to send a spacecraft into the sun itself. Solar Probe Plus, scheduled for launch in 2018, will plunge so far into the sun’s atmosphere that the sun will appear as much as 23 times wider than it does in the skies of Earth. At closest approach, about 7 million km from the sun’s surface, Solar Probe Plus must withstand temperatures greater than 1400 deg. C and survive blasts of radiation at levels not experienced by any previous spacecraft. The mission’s goal is to sample the sun’s plasma and magnetic field at the very source of the solar wind. See the full article here. Learn more about Solar Wind here. This is NASA’s science vision: using the vantage point of space to achieve with the science community and our partners a deep scientific understanding of our planet, other planets and solar system bodies, the interplanetary environment, the Sun and its effects on the solar system, and the universe beyond. In so doing, we lay the intellectual foundation for the robotic and human expeditions of the future while meeting today’s needs for scientific information to address national concerns, such as climate change and space weather. At every step we share the journey of scientific exploration with the public and partner with others to substantially improve science, technology, engineering and mathematics (STEM) education nationwide.